Myx Fitness offers high-energy, full-body workouts for moms in a comfortable, non-judgmental atmosphere. Myx Fitness is getting the holiday shopping season off to a flying start on Thursday, December 6th partnering with The Local Moms Network to “celebrate motherhood” and connecting moms with great brands and each other. A new wellness brand, Myx Fitness, offers a boutique fitness studio and showroom located just off the corner of Greenwich Ave and West Elm St. 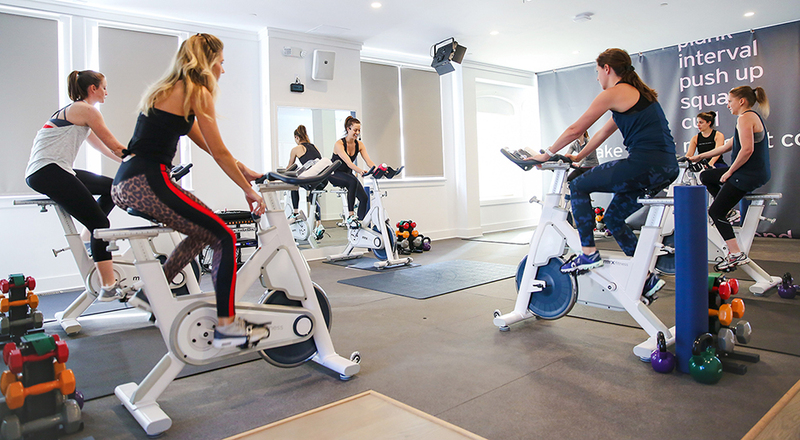 The modern, light-filled space offers high-energy full-body workouts that “Myx” cardio, strength and restorative disciplines, giving participants the feel of a personal training session. Their flagship offering, the Myx Home Studio, offers a customizable, efficient, and affordable fitness studio (indoor bike, weights, foam roller, and more) delivered to your home. Located at 19 W. Elm Street, Greenwich, the day-long celebration is taking place at Myx Fitness from 11 am to 8 pm and is open to the public. Attendees will have an opportunity to participate in targeted fitness classes, talks about parenting and postpartum care and shop must-have mom products and clothes. Myx Fitness will be offering Pre & Postnatal Lengthen & Strengthen Yoga Workouts at noon and 6:30 pm. To sign-up, visit Myx Fitness Studio to save your spot. Throughout the day, attendees will be able to Test Ride bikes and learn about the soon to be released Myx Home Studio product, which will be available for purchase at a special introductory rate. Attendees can shop New York City-based lifestyle maternity brand HATCH. The chic line, founded by former Wall Streeter Ariane Goldman, is meant to be born worn during pregnancy and after. Luxe baby and child collection, Sammy + Nat, founded by Samantha Benson creates stylish staple pieces for little ones. With their signature line made from quality Peruvian cottons, caters to today’s design conscious millennial parents, who appreciate timeless clothing for their children at affordable prices, by offering modern designs combined with quality craftsmanship. To help connect the fashion dots, Stephanie Trotta, noted stylist and creator of The Girl Guide will be on hand to help shoppers make “smart” choices. Remedy Bodyworks, a health and wellness center will be offering attendees the opportunity to sample a mini-CryoFacial. This is the perfect opportunity to address your skin care needs and pamper your skin quickly on a first come basis. The Parent Collective, which offers classes for first time parents as well as second/third/time parents, will be providing helpful information on “What To Expect” as well as information on different classes couples can take, close to home and to help establish a crucial support system all new parents need throughout the day. Popular children’s musician Graham Clarke will perform a free concert at 4 pm. The day ends with Better Postpartum, Founder Natalie Telyatnikov leading a discussion with new and expecting moms on how to improve their postpartum experience and to alleviate any struggles of early motherhood, starting at 7:30 pm. To make this an event to remember, Myx Kitchen will be serving complimentary refreshments and snacks in Myx Studio throughout the event. Attendees will receive a Fjällräven swag bag, from the highly sought after Swedish outdoors brand, which recently opened their doors on Greenwich Avenue. The bag, full of snacks, gift vouchers and product samples like, Made Of® will be available while supplies last. “We’re all about ‘giving moms the gift of time,’ and this event is definitely going to do that. I’m thrilled to partner will some of the best brands, from revolutionary products to truly helpful services,” explained Layla Lisiewski, founder, The Local Moms Network, a hyper-local platform in almost 50 suburbs across the United States.